Isaac Thuret with the Balance Spring invented by Christiaan Huygens. 6. Who ordered this clock? Figure 1. The recently discovered longitude timekeeper by Isaac Thuret, signed Thuret A Paris, 1675-1680. The recent discovery of an extremely interesting clock signed Thuret A Paris reveals that this clockmaker was much more closely involved in the development of a clock to be used for finding longitudes at sea than has generally been assumed. Isaac Thuret was the clockmaker who made for Christiaan Huygens the first watch with a spiral spring regulating the movements of the balance wheel in 1675. The conflict about his contribution to the invention is usually seen as to have ended their cooperation. However, a closer study of Huygens' correspondence strongly suggests that this was not the case. This longitude timekeeper, provided with the pirouette as published by Huygens but abandoned by the makers of pocket watches, supports this view. Its close correspondence in design with the later marine chronometers (no remontoire neither fusee) confirms that Huygens and Thuret, apart from the pirouette, were on the right track. However, it would take a century before the reliability and accuracy of the mechanic timekeeper reached the level required for measuring longitudes. The recent discovery of an extremely interesting clock signed Thuret A Paris reveals that this clockmaker was much more closely involved in the development of a clock to be used for the measurement of longitudes at sea than has generally been assumed. Isaac Thuret (about 1630-1706) was the most distinguished Paris clockmaker of the second half of the 17th century, Horloger Ordinaire du Roi and clockmaker of the Académie Royale des Sciences and its observatory. He made the first watch with a spiral spring attached to the balance wheel invented by Christiaan Huygens in 1675, to be considered as the most important step forward in the development of accurate mechanic watches. However, it was not known that Thuret ever had used this invention to construct a timekeeper specially designed for finding longitude at sea, a true precursor of the marine chronometers developed in the 18th century. The clock illustrated in Figure 1 shows that he actually made such a clock. Restudying Christaan Huygens' Œuvres Complètes in the light of this discovery showed that his invention of the spiral balance spring was much more aimed at the problem of measuring longitude than is usually realised. The significance of Thuret's clock can only be understood fully against the background of his close relation and cooperation with Huygens. Therefore, I will deal with this relation prior to giving a description of the clock. The earliest reference to Thuret in the preserved correspondence of Huygens is in 1662. Apparently, Christiaan Huygens had not met Thuret during his second visit to Paris in 1660-61. Shortly after his return in May, 1661, his father Constantijn Huygens1 was sent to Paris to negotiate the restitution of the principality of Orange to the ten-year old Prince Willem, the later stadholder of The Netherlands and King William III of England, Scotland, and Ireland with his wife Queen Mary. A letter from Christiaan in The Hague to his brother Lodewijk, who accompanied his father to Paris, strongly suggests that Constantijn had brought with him a pendulum clock as a present to King Louis XIV.2 We know that the successful application of the pendulum as a clock regulator by Huygens in 1656-7 had been highly enthousiastically received in Paris and that several clocks made in The Hague had already found their way to that city.3 So, it is perfectly understandable that the proud father presented one to the French king. From these letters we know that the first personal contacts between Christiaan Huygens and Isaac Thuret resulted in a close cooperation in the care of early pendulum clocks sent from The Hague. Although we have no direct letters to Thuret, he is mentioned again and again in Huygens' correspondence in the period between the latter's return to Holland in June, 1664, and his move to Paris two years later. Pierre Petit11 gives an obscure description of some construction by Thuret.12 A later letter reveals that Thuret had designed a remontoire13 to increase the accuracy of a timekeeper, which illustrates the inventiveness of this maker.14 Huygens played down this achievement, obviously because he himself was involved in a similar endeavour. Returning to the marine clocks, it is significant that Huygens discovered, additional to the very difficult problem of keeping a pendulum clock going at sea with the required accuracy, a quite unexpected other drawback of his construction. The America trip of 1672-3 revealed that the length of a one-second pendulum is not a universal measure but depends on latitude.34 Huygens had to face the fact that the pendulum as a timekeeper at sea had not only practical but also more fundamental disadvantages. This knowledge may have prepared his mind to look in quite another direction for regulating clocks for finding longitude at sea. His interest in using a spring in combination with the traditional balance, resulting in the spiral spring universally applied after 1675, should be seen against this background. Figure 2. Earliest sketch by Christiaan Huygens of a clock balance combined with a spiral spring . The notes begin with the first sketch of Huygens' idea of how to provide the balance of a clock with a spiral spring in order to get a more accurate timekeeper, dated Sunday, 20 January 1675, see Figure 2. The next day, Huygens tries two times to find Thuret in order to have his idea converted into a model, but Thuret is not in his workshop. A third visit on the morning of 22 January is more successful and Huygens communicates his invention confidentially to Thuret who reacts very enthousiastically. Immediately, Thuret starts making a model according to Huygens' instruction and, without a lunch break, the model is finished at about three o'clock in the afternoon. We might expect that this model was a watch provisionally provided with a spiral spring. Huygens takes this model with him to his room. However, Thuret does not stop after Huygens' departure, but tries out what may have been a slightly different, and improved, application of the invention on a watch of his own. He is so proud of the result that on the next day, 23 January, he calls Huygens away from a meeting to show the construction, asking to keep it secret. Subsequent versions are seen by Huygens on the next two days. With the intention to get a patent, Huygens shows his model on 31 January to Colbert, the important minister to Louis XIV and promotor of the sciences. On the afternoon of the same day, he visits Thuret and tells him to have been to Colbert who, indeed, had promised a patent. Thuret expresses his hope to be considered as a participant in the invention, but Huygens refuses. He responds that Thuret will profit more from the invention than Huygens himself and that he alway will testify that Thuret had contributed so much skill to the execution of the invention. It is understandable that Thuret was not very happy with this answer. As Thuret was finishing a watch after the new invention to be presented to the king, he asks Huygens not to make haste in requesting a patent in which Huygens agrees. The next day, Huygens hears that, according to some people, Thuret has told around to have contributed significantly to the invention. In view of this, he decides to hasten the patent procedure and to remonstrate Thuret about his pretentions. For various reasons, this meeting does not find place until 4 February. The bomb bursts really on 8 February when Huygens discovers, as his own words read, 'that Thuret had shown my invention to M. Colbert eight days before me'. Without having told to Huygens, Thuret had gone to Colbert as early as January 23 with a watch in which the balance was provided with a spiral spring. The next day, 9 February, in the presence of some witnesses who knew Huygens' role in the invention, Thuret tries to deny the accusition but, in a subsequent interview, he has to admit. In the margin of this confession in his notes, Huygens added to have given the watch to Gaudron in order to get it finished. 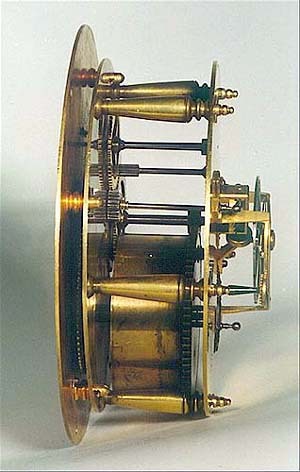 a spring turned as a spiral which regulates the rotations of a free balance, larger and heavier than in the usual works; by this, clocks constructed in little will give very accurate pocket watches and, in larger designs, everywhere and in particular for finding the longutudes both at sea and on land. With his letter referred to above, Thuret's exclusion from Huygens' general arrangements to make clocks and watches as patented came to an end. One may rightly ask why Huygens introduced the wheel between balance and escapement as it represents an additional source of friction. Apparently he had the opinion that a lower oscillation frequency, with less frequent impulses given to the verge, results in a more detached, and therefore more accurate, escapement. In pendulum clocks he tried to reach this with a long pendulum and in his new invention by a balance moving rather slowly over a wide angle. In order to limit the angle over which the verge rotates, this made the extra gear necessary. Because of the slow large movements of the balance, this construction became known as the pirouette. However, the piroutte was not very practical in watches and was soon, perhaps even immediately, superseded by a faster oscillating balance directly attached to the verge as in Figure 2. The significance of the presence of two versions in Huygens' papers is usually overlooked, as if the pirouette represented an essential part of his new invention. The main attention for this version in the literature is understandable as this is the one Huygens published in his Letter in which he refers to pocket watches as well as to clocks for finding longitude, repeating the description of the patent given above. Without doubt, the latter application had the priority in his publication and, therefore, the pirouette version was illustrated because it represented in Huygens' view the most precise one. 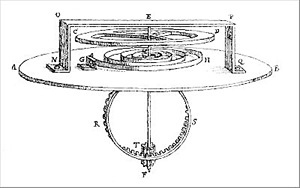 This is comparable with what he did in his Horologium (1658) and Horologium Oscillatorium (1673), both based on weight-driven clocks with long pendulums aiming at scientific purposes, not on the less accurate spring-driven clocks with short pendulums much more frequently made by the clockmakers and sent by Huygens to his acquaintances in Paris. Figure 3. Drawing of the spring balance construction, known as the pirouette, published by Christiaan Huygens in his letter in the Journal des Sçavants of 25 February 1675. The pinion T and the wheel RS represent the extra gear between the balance and the verge (the latter not drawn). It is made by Thuret, who makes up to now the best [watches] and with great demand. He is the one who has treated me so badly after I had confided him that invention. But, having retracted in the end by a letter which others had obliged him to write to me, and having come to me to ask pardon, I have no difficulties anymore to employ him. Hence, we have every reason to assume that, as Huygens demonstrated by the watch just mentioned, the cooperation with Thuret continued. These quotations may convince that Huygens strongly believed in the ultimate supremacy of the balance spring over the pendulum for the best timekeeper at sea. As Figure 1 already showed, the recently discovered clock by Thuret has a brass case in the shape of a cylinder. The diameter of the cylinder is 16.8 cm and its length 8.3 cm. The front door, provided with glass, and the turned brass back door are hinged at the left side as usual in French clocks; both are gilded. The case itself is of rather thin red copper covered with grey fishskin (ray). The inner side is reinforced with a brass ring to which a pair of lead plates are attached at the left side as a counterbalance of the heavy spring barrel positioned at the right. There can be no doubt that the clock was designed to be used on board of a ship because the top of the case is provided with an iron ball enclosed by a brass cylinder for free moving, see Figure 1. This construction can be recognized as a contribution of Alexander Bruce to the first seagoing pendulum clocks designed by Christiaan Huygens.58 After the latter's definitive return to The Netherlands, the device was occasionally used by clockmakers who worked for Christiaan Huygens for similarly shaped clocks made for general use on board of ships. The gilt brass dial plate (diameter 16.0 cm) has three silver rings: the upper one for the hours, the lower right one for the minutes and the lower left one for the seconds. The plate is beatifully engraved after the best French tradition, with a border of acanthus leaves enclosing flower scrolls and a mask in the area outside the rings. At the top the name of the maker Thuret A Paris is engraved. Figure 4. The movement of the Thuret clock. Figure 4 reveals that the movement is driven by a going spring barrel. This is a clear indication of the strong influence of Huygens on the clock's construction. As is well known, Huygens' trust in the accuracy of the pendulum was so great that he abandoned the fusee traditionally applied in spring-driven clocks to compensate for the variation in the force of the spring. In this Huygens was followed by the Dutch as well as the French clockmakers in their pendulum clocks (but not by the English). Hence, it is understandable that Thuret's clock is not provided with a fusee. As the many preserved watches with early balance springs demonstrate, this practice was very soon abandoned by the watchmakers who, as before, provided their watches with a fusee. The gearwheel of the going barrel operates the pinion on the shaft of the minute hand. Through an intermediate gear the seconds hand is driven to which the crown wheel of the escapement is geared. Figure 4 indicates that, most unusual, the escapement is not situated between the main plates of the movement, but behind to the (gilt) back plate as an additional device. This position might be an indication that the construction was considered to be more or less experimental, easy to modify if necessary. Figure 5 shows the escapement in more detail. Between the large (diameter 4.9 cm) and relatively light balance wheel and the verge is an extra gear, implicating that the balance wheel has to turn over a relatively large angle of about 150 degrees before the next pallet is released. This means that, as was Huygens' intention, the balance wheel is moving rather slowly, with an oscillation period of 1 sec. The movement is going for three days. Figure 5. The escapement of the Thuret clock. A little plate is screwed to the bridge supporing the balance shaft with the name of the maker THURET. This plate is significant in various respects. Firstly, the name is written in capital as in the Thuret clock for astronomical purposes Huygens brought with him to The Netherlands31 but never seen in his clocks made for general use. Secondly, the position of the nameplate on the escapement can be interpreted as a demonstration of the close connection between the maker and the construction. Thirdly, we may wonder whether the fact that just his name is engraved on a separate plate rather than directly on the bridge resulted from an initial uncertainty by Thuret whether and how to sign the movement: in view of his own claims Huygens invenit, Thuret fecit would not have satisfied his dignity whereas Thuret invenit & fecit would have raked up the conflict with Huygens. Above the name plate we see the regulator for adjusting the oscillation period of the balance. The well-considered design as well as its refined execution strongly suggest that the clock was made to be actually tested on board of a ship rather than merely as an experimental construction to test the accuracy of the new invention on Thuret's workbench or Huygens' desk. This leads immediately to the intriguing question on whose initiative we owe the clock. There are three possibilities: (1) the clock was ordered by Christiaan Huygens, (2) by someone else, or (3) Isaac Thuret himself took the initiative. In my opinion, we may consider the second possibility as rather unlikely. The complicated verification of the clock's reliability in an actual situation could not be trusted to a ship captain but should be carried out under the direct supervision of a scientist familiar with timekeepers and their problems. There are no indications that someone else than Huygens might have been involved. As the later history has confirmed, the initiative of improving the accuracy of clocks and testing their performance was either in the hands of scientists or of clockmakers as John Harrison (1693-1776) and John Arnold (1736-1799) in England and Pierre Le Roy (1717-1785) and Ferdinand Berthoud (1727-1807) in France.59 Hence, it is not unlikely that, if not ordered by Huygens, Thuret himself decided to make a large version of a watch after the new invention, provided with the extra transmission between balance and verge escapement recommended by Huygens but probably never applied in pocket watches. However, this does not solve the problem of a qualified person to test the clock. Therefore, if the clock was made by Thuret on his own initiative, we may expect that Huygens knew about it. Although there is no direct evidence, we should not exclude that, indeed, Huygens not only knew about the clock but had ordered it. As has been referred to above, he considered in 1679 a clock provided with a large-size balance a more succesful candidate for finding longitude than with a pendulum and, three years later, this optimistic view appeared to be supported by actual tests carried out by him. Hence, it is quite reasonable that he asked Thuret to construct such a large-scale version. Without doubt, Huygens considered Thuret to be the most able man for the job and, as we have also seen, he had declared to have no difficulties to employ Thuret after the latter's written apology. 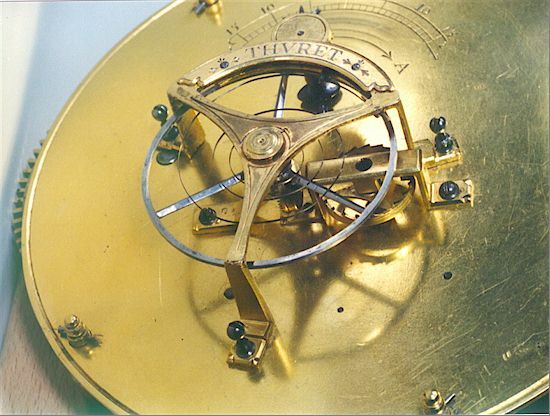 We cannot properly evaluate Huygen's idea of the spring-and-balance construction in general, and its execution by Thuret in the clock described above in particular, without considering these achievements in the light of the later development of the marine chronometer in the eighteenth century. As was mentioned, Huygens believed his new invention to represent the most promising direction to solve the problem of measuring longitudes at sea. It seems justified to conclude that he saw mechanical problems as the major reason why, at that moment, the spring balance could not compete with the pendulum. In agreement with his general style of working, he will have considered these problems as primarily a challenge for clockmakers rather than for scientists. The developments in the 18th century have demonstrated that this was true. Although Isaac Newton (1642-1727), the most distinguished scientist of his age, was convinced of the contrary,61 the problem was solved, indeed, by clockmakers. As this history has been described extensively before,59 I restrict myself here to a few most essential aspects. In England, the clockmaker John Harrison developed several instruments before ending up with his famous large watch known as H.4, successfully tested at sea in the winter of 1761-2. This watch was provided with an improved verge escapement, with the effective length of the spiral spring automatically controlled by a bimetal strip to minimize temperature effects. Although Harrison fully realized that 'the less the wheels have to do with the balance, the better',62 he needed a (most ingenious) remontoire and a going barrel with fusee, both absent in Thuret's clock, in order to equalize the driving force as much as possible. Harrison's remark just quoted touches the essence of the chronometer problem. The combination of balance wheel and spiral spring is an oscillator functioning optimally if free from any coupling. The problem of its unavoidable energy losses has to be solved by a device supplying periodically small packets of energy. The verge escapement is such a device but, because the teeth of the crown (escape) wheel are constantly pressing against the pallets attached to the spindle of the balance wheel, there is a rather strong coupling with the driving force, most fatal for its accuracy. Harrison's attempt to reduce this coupling by modifying the pallets was not sufficient to eliminate fully the coupling problem. In his spring-driven clock, he tried to reduce the coupling effect with a combination of a remontoire and a fusee. Le Roy's clock is the instrument on which the subsequent improvements of the mechanical chronometer can be considered to be based. If we compare the chronometers made by Harrison and Le Roy with the clock constructed by Isaac Thuret according to Huygen's invention, the conclusion is clear. Essentially, Le Roy's solution is a highly improved version of the Thuret clock with the escapement almost free from the driving train and the balance adequately compensated for temperature effects. These refinements may seem simple, but their development took almost a century. 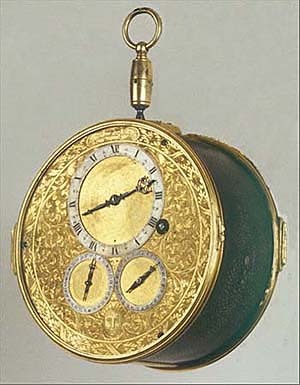 In conclusion, this historical perspective may have shown that much had to be done by clockmakers rather than scientists before the promising prototype as a result of Huygen's ingenious invention and Thuret's superior workmanship was transformed into a chronometer suffciently accurate for measuring longitudes at sea. Giving up the pirouette was the easiest step, already done by the watchmakers, followed by freeing the balance from temperature effects and the escapement from coupling. Along this route neither the remontoire nor the fusee had to be reintroduced. The clock resulting from the cooperation of Huygens and Thuret did not represent a blind alley but was the beginning of a promising development. We may be happy that, whereas all earlier and later pendulum clocks designed by Huygens to solve the problem of measuring longitude at sea have vanished, this balance clock has been preserved. As the list of notes shows, nearly all information in this article has been taken from Christiaan Huygens' correspondence and the extensive notes added by the editors of his Œuvres Complètes. As more recent research and/or discoveries may have yielded results throwing new light on the collaboration of Huygens and Thuret on clocks in general and on marine clocks in particular, the author will highly appreciate to be informed. 1 Constantijn Huygens (1596-1687) was the very gifted and much-travelled secretary of Prince William of Orange. 2 Letter dated 23 November, 1661; Œuvres Complètes de Christiaan Huygens publiées par la Société Hollandaise des Sciences, 22 vols (The Hague, 1888-1950), III, 389. 3 See for a survey of early pendulum clocks made in The Hague and brought to Paris, derived from Huygens' correspondence: R. Plomp, 'The Dutch origin of the French pendulum clock', Antiquarian Horology, 8 (1972), 24-41. Further information on the development of early French and Dutch pendulum clocks, and their strong relations, in: R. Plomp, 'Dutch influences in French clockmaking and vice-versa in the latter half of the seventeenth century', Antiquarian Horology, 9 (1974), 28-45; R. Plomp, Spring-Driven Dutch Pendulum Clocks, 1657-1710 (Schiedam, 1979). 4 J.-D. Augarde, Les Ouvriers du Temps - La Pendule à Paris de Louis XIV à Napoléon Ier / Ornamental Clocks and Clockmakers in Eighteenth Century Paris (Génève, 1996). This book contains a wealth of historical information about early Parish pendulum clock makers not known before. 5 Œuvres Complètes, IV, 110. 6 Salomon Coster was the Hague clockmaker who made the first pendulum clocks as invented by Christiaan Huygens in December, 1656. After his death three years later, Huygens used the clockmakers Severijn Oosterwijck and Claude Pascal; see note 3. 7 Œuvres Complètes, V, 18. 8 Letters dated 28 March and 25 April 1664; Œuvres Complètes, V, 51 and 57. 9 Letter dated 26 April 1664; Œuvres Complètes, V, 59. 10 See also his letter dated 16 May 1664; Œuvres Complètes, V, 65. 11 Pierre Petit (1598-1677) was an engineer, councillor and geographer to the king, general intendant of fortifications, who loved to invent and construct new machines. 12 Letter dated 17 October 1664; Œuvres Complètes, V, 124. 13 A device to rewind the clock automatically at short intervals. 14 Letter of Christiaan Huygens to his father, dated 19 February 1665; Œuvres Complètes, V, 240. Christiaan comments in this letter that a similar device had been made earlier by Salomon Coster and Claude Pascal, most probably on his instruction. 15 In a letter dated 12 January 1657 to Frans van Schooten, professor of mathematics at Leiden University, Huygens had written: 'I have just in these days invented a new construction for a clock which measures time so accurately that there is no little hope of being able by its operation to determine longitudes at sea.' Œuvres Complètes, II, 5. 16 Œuvres Complètes, XVIII, 7. The text of the request seems to have been written by Constantijn Huygens himself, see page 20. 17 Jean Chapelain (1595-1677), one of the main Paris correspondents of Huygens, was councillor of Louis XIV, a mediocre poet but an enthousiastic amateur in the sciences. 18 Œuvres Complètes, V, 267. 19 Letter of Christiaan Huygens to his father, dated 26 March 1665; Œuvres Complètes, V, 276. 20 Letters dated 24 April and 7 June 1665; Œuvres Complètes, V, 341 and 370. 21 One clock was for Henri Louis Habert de Monmor, the other for Pierre de Carcavi; see Œuvres Complètes, V, 474-476. 22 Letter dated 23 October 1665; Œuvres Complètes, V, 511. 23 The astronomer Ismael Boulliau (1605-94) mentions Christiaan Huygens 'omnium caput' of the Académie Royale des Sciences, see Œuvres Complètes, XVIII, 4. 24 Letter dated 6 January 1668; Œuvres Complètes, VI, 171. 25 See for a description of these remontoires Œuvres Complètes, XVII, 178-182, based on a drawing by Huygens himself. 26 Letter dated 30 March 1669 to Sir Robert Moray (?-1673), who had been the first president of the Royal Society in 1660-2, one of the main correspondents of Huygens in London; Œuvres Complètes, VI, 396. 27 Letter dated 29 May 1669 to Henry Oldenburg (1626-78), secretary of the Royal Society and another main correspondent of Huygens in London; Œuvres Complètes, VI, 440. 28 Œuvres Complètes, XVIII, 18-19. 29 Letter to Henry Oldenburg dated 13 February 1672; Œuvres Complètes, VII, 142. 30 Œuvres Complètes, XVIII, 71. 31 Shown in Œuvres Complètes, XVIII, 18. 32 This clock was discovered recently. The movement shows clearly that it is not from a Paris clockmaker. Most probably, the clock was made in Copenhagen according to a French model by Thuret after Rømer's return in 1671 from his ten-years stay at the Paris observatory. It is known that the French astronomer Jean Picard (?-1682-3), who was sent by King Louis XIV to Tycho Brahe in Copenhagen in the same year, brought with him two astronomical clocks, one with a one-second, the other with a half-second pendulum; both were most likely made by the conservatory's clockmaker Thuret (destroyed by the fire in 1728). See Œuvres Complètes, XVIII, 18, in which Picard's 'Voyage d'Uranibourg' is quoted, published in the Mémoires de l'Académie Royale des Sciences depuis 1666 jusqu'à 1699, II, part 1 (Paris, 1729). 33 Œuvres Complètes, XVIII, 505, note 9, quoting from the Comptes des Bâtiments du Roi, sous le règne de Louis XIV (1664-1687), published by J. Guiffrey (Paris, 1881). This source also mentions a planetarium in 1680, a 'machine for measuring the eclipses' in 1682 and a 'parallax machine for observations' in 1687, all made by Thuret. 34 See Œuvres Complètes, VII, 117, note 12. The source is his 'Observations astronomique et physique faites en l'isle de Caïenne' published in the Mémoires de l'Académie Royale des Sciences depuis 1666 jusqu'à 1699, II, part 1 (Paris, 1729). 35 Robert Hooke (1635-1703) was Curator of Experiments to the Royal Society and succeeded Oldenburg in 1677 as its Secretary. 36 Letter dated 1 August 1665; Œuvres Complètes, V, 427. 37 Letter dated 18 September 18 1665; Œuvres Complètes, V, 486. 38 Œuvres Complètes, XXII, 535. 39 Letter dated 24 December 1665; Œuvres Complètes, V, 549. 40 See Œuvres Complètes, XVIII, 481-498. 41 Œuvres Complètes, XVIII, 497, Figure 16. 42 Œuvres Complètes, VII, 408-416. 43 I agree with Leopold that, since we have only Huygens' version of this controversy, Thuret's contribution probably may have been larger than suggested; J.H. Leopold, 'Christiaan Huygens and his instrument makers', in: Studies on Christiaan Huygens, edited by H.J.M. Bos et al. (Lisse, 1980), 228. 44 Œuvres Complètes, VII, 498. 45 Œuvres Complètes, VII, 419. 46 Œuvres Complètes, VII, 425. 47 Letters dated 15 and 24 May 1975; Œuvres Complètes, VII, 462 and 464. 48 Letter dated 7 October 1675; Œuvres Complètes, VII, 509. 49 Letter dated 12 October 1675; Œuvres Complètes, VII, 510. 50 Robert Hooke himself wrote in his diary: 'Zulichems [= Huygens] spring not worth a farthing' (February 20, 1675, Old Style); Diary of Robert Hooke, edited by H.W. Robinson and W. Adams (London, 1935), 148. See for a quite different application of the balance spring by Hooke page 151. 51 Letter dated 9 February 1675; Œuvres Complètes, VII, 405. 52 Œuvres Complètes, VII, 542. 53 Œuvres Complètes, VII, 477. 54 Letter dated 10 August 1675; Œuvres Complètes, VII, 489. 55 Letter to H. Justel dated 1 May 1675; Œuvres Complètes, VII, 456. 56 Dated 15 August 1679; Œuvres Complètes, VIII, 197. 57 Letter to J. Gallois dated 1 October 1682; Œuvres Complètes, VIII, 394. 58 Œuvres Complètes, XVII, 167 and XVIII, 114-117; see for the cooperation with Alexander Bruce (?-1681) in the tests of 1662-4 J.H. Leopold (note 60). 59 The classical source for the history of this development is: R.T. Gould, Marine Chronometer - Its History and Development, (London, 1923 and reprinted in later years). An excellent recent survey with a wider scope is The Quest for Longitude, edited by W.J.H. Andrewes, (Cambridge, Mass., 1996). 60 Œuvres Complètes, XVIII, 527. See J.H. Leopold, 'The longitude timekeepers of Christiaan Huygens' in W.J.H. Andrewes (note 59), 102-114. 61 See W.J.H. Andrewes, 'Even Newton Could Be Wrong: The Story of Harrison's First Three Sea Clocks, in W.J.H. Andrewes (note 59), 190-191. 62 Quoted in R.T. Gould (note 59), 1960 edition, 51 and 83. 63 'If we contrast this marvellous machine [Le Roy's watch] with No. 4, which, in its own way, is equally wonderful, Le Roy's superiority as a horologist is evident. Harrison took the escapement, balance, and general arrangement of the ordinary watch of his day, and by fitting a remontoire and maintainer, an automatic regulator, and diamond pallets, aided by high-numbered wheels and pinions and lavish jewelling, he compelled it to become an efficient timekeeper. Le Roy attacked the problem from an entirely different standpoint, and obtained his results not by nullifying defects, but by eliminating them. The difference in their machines is fundamental - Harrison built a wonderful house on the sand; but Le Roy dug down to the rock. '; in R.T. Gould (note 59), 1960 edition, 90-91.